Is Anyone Shocked That Slavery Continued a Century After Emancipation? The former slave quarters of the Boone Hill Plantation on July 16, 2015, in Mount Pleasant, S.C. Given the state of the world today, and being a black woman in America, I’m rarely shocked, especially when it comes to racial terror and exploitation. But admittedly, I was taken aback when an African-American historian and genealogist presented actual documentation of black communities in the Deep South that were enslaved well into the 1960s. Like many of us, 57-year-old Antoinette Harrell took it upon herself to record her family’s history. Yet Harrell’s 20-year journey took her to places far darker and deeper. Harrell, who told her story to a reporter at Vice, said that she had been doing genealogical research in Louisiana for some years and was approached by a woman who told her that her family had been enslaved in the 20th century. That woman then introduced her to about 20 people who said they had all worked on the Waterford Plantation in St. Charles Parish, La., and had become indebted to the plantation owner. Now, we’ve all heard of sharecropping and peonage (outlawed by Congress in 1867), but what made this truly modern-day slavery was that these workers were not allowed to leave the property. “Some of those folks were tied to that land into the 1960s,” Harrell said. One story in particular, though, was chilling. Harrell said that after giving a lecture on genealogy and reparations in Amite, La., she met Mae Louise Walls Miller, who actually said these words: “I didn’t get my freedom until 1963.” The abuse and terror of Miller’s story mirrored the horrors of chattel slavery, supposedly outlawed some 100 years before. Mae’s father Cain Wall lost his land by signing a contract he couldn’t read that had sealed his entire family’s fate. As a young girl, Mae didn’t know that her family’s situation was different from anyone else’s. The family didn’t have TV, so Mae just assumed everyone lived the same way her brothers and sisters did. They were not permitted to leave the land and were subject to regular beatings from the land owners. When Mae got a bit older, she would be told to come up to work in the main house with her mother. Here she would be raped by whatever men were present. Most times her and her mother were raped simultaneously alongside one another. When Mae was about 14, she decided she would no longer go up to the house. Her family pleaded with her as the punishment would come down on all of them. Mae refused and sassed the farm owner’s wife when she told her to work. Worrying that Mae would be killed by the owners, Cain beat his own daughter bloody in hopes of saving her. That evening still covered in blood, Mae ran away through the woods. She was hiding in the bushes by the road when a family rode by with their mule cart. The lady on the cart saw the bush moving. She got off to find Mae crying, bloodied and terrified. That white family took her in and rescued the rest of the Wall’s later that night. Sometimes, when we would be at an event where there was free food, she couldn’t stop eating. She told me this was from years of not knowing when she would eat again. There were other times she would need to take her shoes off. She had grown up not wearing shoes and said sometimes her feet felt uncomfortable when she wore them. The nuances of Mae’s PTSD from growing up as a slave gave me a peek into what life must have been like for many of our ancestors who were held under such inhumane conditions. Harrell said that not only are these stories more common than we think, but because of the pervasive and unyielding terror inflicted on black bodies for so long, the fear of very real consequences persists to this day. The saddest part of this painful but true story, however, is that Harrell said that slavery continues to morph and redefine itself in the United States today, whether through the school-to-prison pipeline, private prisons or the money-bail system. 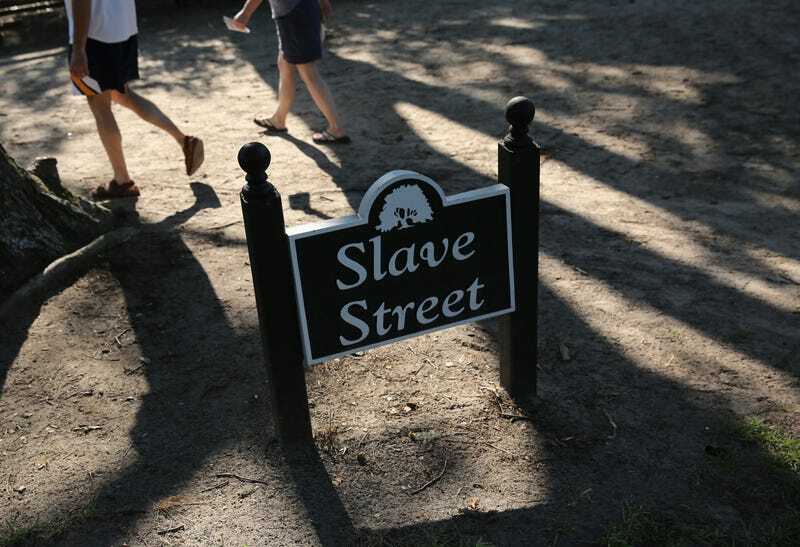 “If we don’t investigate and bring to light how slavery quietly continued, it could happen again,” she said.